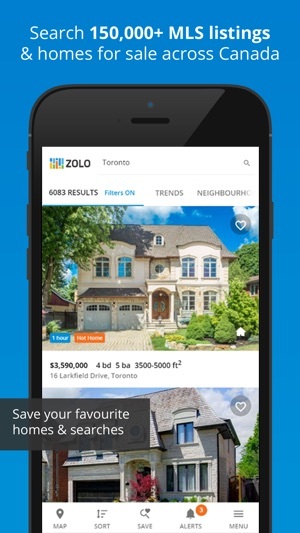 Find a home you'll love with the free Zolo real estate app powered by local MLS listings. Search 150,000+ homes for sale across Canada. Used by 4 million Canadians each month, enjoy the MLS search of the most popular Realtor brokerage site in Canada. "So user friendly. No comparison out there." 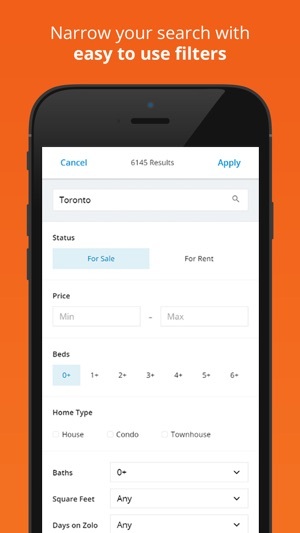 "This is one of the best Real Estate apps because it's simple and has many listings." "Your pics and info and map are so wonderful!" THE MOST ACCURATE LISTINGS – View house data straight from Realtor MLS listings, refreshed every 15 minutes. AN AMAZING SEARCH – View 150,000+ properties for sale across Canada. BIG BEAUTIFUL PHOTOS - Scroll through vivid, full-screen photos of houses, condos, and apartments. HOMES JUST FOR YOU - Input your preferences and filter by property type, price, beds, baths, size, and more. BROWSE YOUR WAY - Explore homes by photos or map. Sort by the newest MLS listings or most/least expensive. DISCOVER THE LIFESTYLE - Find out about neighbourhood amenities like restaurants, parks, gyms, and schools. REAL-TIME MARKET TRENDS - See housing stats like average price, growth, days listed, inventory, solds, etc. BUDGET FOR YOUR DREAM - See what it will cost to live in your dream home with a simple mortgage calculator. TAKE YOUR HOMES WITH YOU - Save your favourite homes/searches. View them on the web or any mobile device. 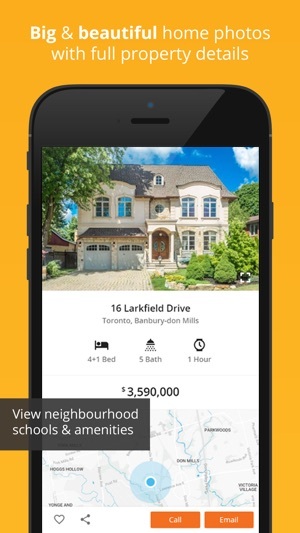 NEVER LOSE OUT – Get notified when new MLS listings hit the market, drop in price, or are sold. AGENTS ON YOUR SIDE - Quickly get in touch with local Zolo real estate agents and tour the properties you love. If you love apps like Zillow, Trulia, or Realtor.com in the US - Zolo is the best real estate app for finding your home in Canada. View houses and condos from popular real estate companies like Remax, Royal LePage, Sutton, and Century 21. DOWNLOAD today and find your perfect house or condo - available on iPad too! I like the app, it's more functional than others I've tried; however, the maps feature is really outdated. I constantly have to go to Google maps to get more up to date satellite images. Then, I find out why the place is probably listed. i.e. New subdivision being built right behind the house when forest was shown in the Zolo listing. Or forest is shown and the whole area for miles was clear cut. I'd love the app if they used Google maps or the most up to date satellite images available. The app is very simple and user friendly. Request to get more information on a home and a real estate sales rep will be in touch within the hour! Great if you are looking for a place and on the go.